Finals: (gold medal) Wales (Dan Salmon, Marc Wyatt) bt Scotland (Paul Foster, Alex Marshall) 12-10, (bronze) Cook Islands (Aidan Zittersteijn, Taiki Paniani) bt Malta (Shaun Parnis, Brendan Aquilina) 17-11. Finals: (gold medal) Australia (Kelsey Cottrell, Carla Krizanic, Bec Van Asch, Natasha Scott) bt South Africa (Esmé Kruger, Nici Neal, Anneke Snyman, Elma Davis) 18-16, (bronze) Malta (Rebecca Rixon, Rosemaree Rixon, Connie Rixon, Sharon Callus) bt Canada (Jackie Foster, Joanna Cooper, Pricilla Westlake, Leanne Chinery) 17-8. Sec. A: Rd.1: Rob Paxton (England) bt Arun Kumar (Fiji) 21-13, Shannon McIlroy (New Zealand) bt Andrew Newell (Jamaica) 21-0, Krishna Xalxo (India) bt Kimwaki Kimani (Kenya) 21-12. Rd.2: Paxton bt Xalxo 21-19, McIlroy bt Kumar 21-15, Kimani bt Newell 21-2. Sec. B: Rd.1: Ryan Bester (Canada) bt Clive McGreal (Isle of Man) 21-8, Gary Kelly (Northern Ireland) bt Matu Bazo (Papua New Guinea) 21-4, Malcolm de Sousa (Jersey) bt John Gaborutwe (Botswana) 21-16. Rd.2: Bester bt Gaborutwe 21-4, Kelly bt De Sousa 21-20, Bazo bt McGreal 21-18. Sec. C: Rd.1: Rahman Omar (Brunei Darussalam) bt Dalton Tagelagi (Niue) 21-14, Soufi Rusli (Malaysia) bt Todd Priaulx (Guernsey) 21-11, Darren Burnett (Scotland) bt Edward Bell (Samoa) 21-2. Rd.2: Priaulx bt Bell 21-3, Burnett bt Tagelagi 21-3, Rusli bt Omar 21-13. Sec. D: Rd.1: Aaron Wilson (Australia) bt Taiki Paniani (Cook Islands) 21-6, Dan Salmon (Wales) bt Phil Jones (Norfolk Island) 21-13, Pierre Breitenbach (South Africa) bt Brendan Aquilina (Malta) 21-17. Rd.2: Wilson bt Aquilina 21-17, Breitenbach bt Salmon 21-15, Jones bt Paniani 21-5. Sec. A: Rd.1: India (Lovely Choubey, Ruparani Tirkey) bt Wales (Laura Daniels, Jess Sims) 20-16, South Africa (Nici Neal, Colleen Piketh) bt Jersey (Rachel Macdonald, Chris Grimes) 23-6. Sec. B: Rd.1: New Zealand (Val Smith, Jo Edwards) bt Fiji (Doreen O’Connor, Sheral Mar) 17-16, Norfolk Island (Shae Wilson, Carmen Anderson) bt Tonga (Caroline Dubois, Maili Kioa) 21-10. Sec. C: Rd.1: Scotland (Lesley Doig, Claire Johnston) bt Botswana (Lephai Modutlwa, Nelly Senna) 25-9, Malaysia (Emma Firyana Saroji, Siti Zalina Ahmad) bt Brunei Darussalam (Suhana Daud, Ajijah Muntol) 28-10. Sec. D: Rd.1: Australia (Kelsey Cottrell, Karen Murphy) bt Zambia (Eddah Mpezeni, Foster Banda) 24-5, Malta (Rebecca Rixon, Connie Rixon) bt Niue (Cath Papani, Pauline Blumsky) 29-9. Sec. A: Rd.1: Australia (Carla Krizanic, Natasha Scott, Bec van Asch) bt Papua New Guinea (Piwen Karkar, Ju Carlo, Loa Babona) 32-12, Fiji (Radhika Prasad, Loreta Kotoisuva, Litia Tikoisuva) bt India (Frazana Khan, Pinki, Nayanmoni Saikia) 23-15. Rd.2: Canada (Jackie Foster, Joanna Cooper, Pricilla Westlake) bt Fiji 19-15, India bt Papua New Guinea 24-6. Sec. B: Rd.1: Wales (Emma Woodcock, Caroline Taylor, Anwen Butten) bt Jersey (Doreen Moon, Eileen Vowden, Joan Renouf) 18-7, New Zealand (Tayla Bruce, Katelyn Inch, Mandy Boyd) bt Zambia (Mildred Mkandawire, Getrude Siame, Sophia Matipa) 24-12. Rd.2: New Zealand bt Namibia (Lesley Vermeulen, Sheena du Toit, Joanna van den Bergh) 22-15, Jersey bt Zambia 26-12. Sec. C: Rd.1: Malaysia (Auni Kamis, Nur Fidrah Noh, Azalina Arshad) bt Cook Islands (Jacqueline Purea, Tiare Jim, Toekotai Jim) 20-14, Scotland (Kay Moran, Stacey McDougall, Caroline Brown) bt Norfolk Island (Chris Pauling, Tess Evans, Petal Jones) 16-9. Rd.2: Scotland bt Cook Islands 28-10, Malaysia Norfolk Island 24-13. Sec. D: Rd.1: England (Katherine Rednall, Ellen Falkner, Sian Honnor) bt Northern Ireland (Erin Smith, Donna McCloy, Sally McAuley) 16-8, South Africa (Esmé Kruger, Anneke Snyman, Elma Davis) bt Niue (Chris Hipa, Pilena Motufoou, Ku Ioane) 40-7. Rd.2: England bt Niue 42-5, Northern Ireland bt South Africa 14-13. Sec. A: Rd.1: Wales (Ross Owen, Stephen Harris, Marc Wyatt, Jon Tomlinson) bt Papua New Guinea (Manu Walo, Gabriel Tika, Fred Koesan, Polin Pomaleu) 13-10, New Zealand (Mike Nagy, Blake Signal, Paul Girdler, Ali Forsyth) bt Cook Islands (Aidan Zittersteijn, Adoni Wichman-Rairoa, Munokokura Pita, Lawrence Paniani) 21-4. Sec. B: Rd.1: Australia (Barrie Lester, Brett Wilkie, Nathan Rice, Aron Sherriff) bt Botswana (Edwin Nyoka, Nixon Senna, Kabo Gaboutloeloe, Kisto Robert) 21-5, India (Chandan Singh, Sunil Bahadur, Alok Lakra, Dinesh Kumar) bt South Africa (Rudi Jacobs, Morgan Muvhango,Jason Evans, Gerry Baker) 19-7. Sec. 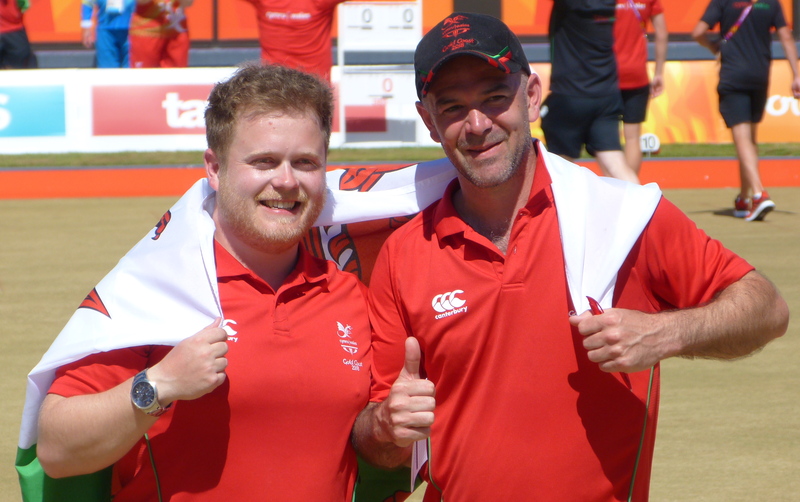 C: Rd.1: Northern Ireland (Simon Martin, Andrew Kyle, Ian McClure, Martin McHugh) bt Namibia (Cabous Olivier, Graham Snyman, Douw Calitz, Will Esterhuizen) 13-11, Malaysia (Syamil Ramli, Ijoi Redzuan, Hizlee Rais, Fairul Muin) bt Niue (Hala Funaki, Mark Blumsky, Keith Papani, Des Hipa) 31-3. Sec. D: Rd.1: Scotland (Ronnie Duncan, Derek Oliver, Paul Foster, Alex Marshall) bt Brunei Darussalam (Ampuan Kasim, Naim Brahim, Tengah Tajudin, Israt Ghani) 25-19, England (Louis Ridout, David Bolt, Jamie Chestney, Sam Tolchard) bt Singapore (Anthony Loh, Melvin Tan, Heng Heck Pang, Bernard Foo) 25-6. Mixed Pairs B2/B3: Rd.5: New Zealand (David Stallard (Peter Blick), Sue Curran (Ann Muir) bt England (Alison Yearling (Susan Wherry), Steve Simmons (Mark Wherry)16-13, Scotland (Irene Edgar (David Thomas), Robert Barr (Sarah-Jane Ewing) bt Australia (Lynne Seymour (Bob Seymour), Jake Fehlberg (Grant Fehlberg) 15-11, South Africa (Nozipho Schroeder (Graham Ward), Philippus Walker (Johanna van Rooyen) bt Wales (JulieThomas (John Byron), Gilbert Miles (John Wilson) 11-8. Current standings: South Africa 12 points +8 shots, Australia 9 +35, Scotland 9 +11, Wales 6 -2, New Zealand 6 -19, England 3 -33. Para-Sport Open Triples B6/B7/B8: Rd.5: Australia (Josh Thornton, Tonny Bonnell, Ken Hanson) bt New Zealand (Bruce Wakefield, Barry Wynks, Mark Noble) 16-11, Wales: Jonathan Hubbard, Raymond Lillycrop, Pauline Wilson) bt England (Kieren Rollings, Paul Brown, Michael Robertson) 15-13, South Africa (Christopher Patton, Tobias Botha, Willem Viljoen) bt Scotland (Garry Brown, Michael Nicoll, Michael Simpson) 15-7. Current standings: Australia 12 points +26 shots, England 10 +11, New Zealand 9 +31, South Africa 7 +14, Scotland 3 -13, Wales 3 -69. 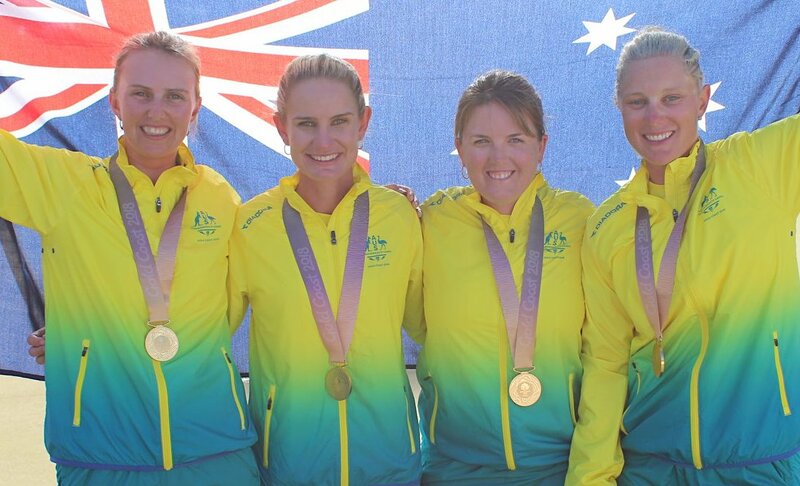 Photo: (a) Australia’s gold medal winning women’s fours team: Kelsey Cottrell, Carla Krizanic, Bec van Asch and Natasha Scott. (b) Welshmen Dan Salmon and Marc Wyatt prevailed in the men’s pairs final.